Oh Liya, Po Mele ..
Dhanushkodi, located just 20 km west of the pilgrimage town of Rameswaram in Tamil Nadu is a strange place. Bordered by the Bay of Bengal on one side and the Indian Ocean on the other, Dhanushkodi a spectacular stretch of land, a sliver of land jutting into the sea. and one of the most spectacular stretches of land. Mirroring the duality of the surrounding two water bodies, the same duality is seen in the lives of people of Dhanushkodi when they fish for six months of the summer in the Bay of Bengal, and the rest of the year in Indian Ocean when the wind changes its course. Fishermen call the Bay of Bengal Penn Kadal, which means a ‘feminine sea,’ as it is calmer than the choppier Indian Ocean, which always is choppy. However, the Bay forgoes its calmness occasionally and can also cause severe destruction. In 1964, a massive cyclone changed the fate of Dhanushkodi forever, destroying the land, killing nearly 1800 people, and sweeping away a train called Boat Mail Express, which was carrying students who would travel from Dhanushkodi to Rameswaram everyday. During the British Raj, Dhanushkodi was a small, flourishing town, much more developed than its neighboring settlements. Perhaps the picturesque beauty or strategic location allowed the development of this little town with modern amenities: there was a police station, a church made of corals, a railway station, a school, and a housing society of over 600 dwellings to provide accommodation to people who worked in ships, trains, and other government offices. After the 1964 cyclone, Dhanushkodi was declared unfit for human habitation, and survivors were rehabilitated in a small town nearby. 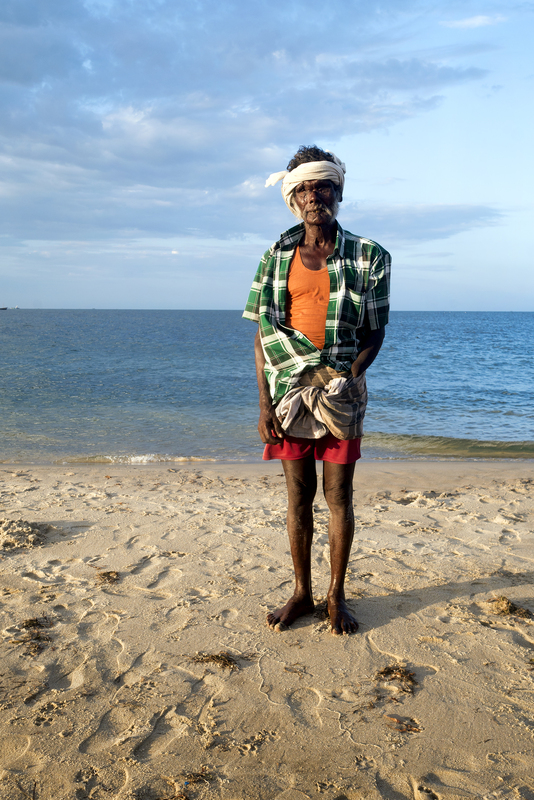 A motley group of fisherfolk, however, came back to Dhanushkodi and have been living there since. There is no electricity, no piped water, or any other amenities. There is only the sand and the sea—home to a bounty of exotic fish, crabs, and lobsters that Indian and Lankan fishermen are constantly fighting over. I stayed in Rameswaram for nearly a month and tried to document the lives of five poor fisherfolk. They face enormous hardships every day just to survive. Here are the stories, seemingly small, yet magnificently heroic, of our protagonists, Karadi, Lakshmi Amma (and her granddaughter Nirmala), Sharnaya, and two sisters, Selvi and Amudha. Their will to live and to survive in the hope of a better tomorrow is heroic in itself. Deepti helped raise Rs.28,000/ – with the help of her friends and family and bought a boat for Pandyan who can’t speak or hear. She taught English in the government school as well. UNSUNG Foundation will partner with her to raise money for the betterment of some of the poorest people of Dhanushkodi. Pulling a net weighing one ton is a tough job, but a fisherman’s life has never been easy. They put themselves at risk everyday in the lap of the unforgiving sea. Some have lost their hands, legs, and even eyes. The children start to fish when they are 10 years old in exchange for free food or a ten-rupee note from their father. So did Karadi. Karadi was just 16 years old when the cyclone hit Dhanushkodi He says that it hit in the wee hours of the morning. He went to higher ground during the cyclone with another 1000 odd people, mostly men. They then started walking towards Rameswaram and then to Mandapam, wading in shoulder-deep water. His family was displaced from Dhanushkodi, and settled in Natrajpuram, a nearby village. Karadi’s real name is Muniyaswami, and he got involved in fishing when he was 21, after the small restaurant run by his father suffered losses, when he was introduced to the dangerous method of ‘blast fishing’ or Vedi Valla. It is the practice of using explosives to stun or kill schools of fish for easy collection. He was an untrained boy and didn’t realize how dangerous it could be. Once, an explosive device went off and he lost his hand and eyesight. The blast left scars on him and led to his new name: Karadi, or bear. After recovering from the accident, it was hard for Karadi to find work. A few people suggested that he take to begging as his deformed face and body might evoke sympathy, but Karadi refused to be a beggar. A person without eyes and a hand could not be a fisherman. Yet, faced with an insurmountable challenge, he found hope and courage within himself. Karadi learnt to swim with one hand and put all his strength into his work, and appeared as the most enthusiastic and energetic fishermen among them all. He continues to fish even today, and sings aloud about the lives of fishermen as he pulls the rope—and no one would know the joys and sorrows of it better than him. Lakshmi Amma, an elderly lady who may be in her late 60s, runs a one of several small shops in Dhanushkodi that sell trinkets to tourists. Her ancestors moved to Sri Lanka and settled in a place called Bechala. When Bechala became unlivable because of the civil war between the Liberation Tigers of Tamil Elam (LTTE) and the Indian Peace Keeping Force (IPKF) in the mid-80s, Lakshmi Amma had to return to India via the Gulf of Mannar. Lakshmi had a big, happy family of 6 children—five sons and a daughter. They had a small boat which her husband and son used for fishing. After the death of her husband four years ago, the family started to fall apart: the elder son became an alcoholic, the youngest got into a debt trap, and the rest distanced themselves from him and their mother. Lakshmi Amma started taking care of her firstborn and of her debt-ridden youngest son’s daughter, a little girl called Nirmala. The son had to leave Dhanushkodi to earn money and had three more daughters in the quest to father a son. Nirmala, who has always been attached to her grandmother, was left back in Dhanushkodi so that she could go to school, and her father didn’t have enough money to pay for it. Nirmala and Lakshmi share a special bond beyond the limits of parenthood. They are the pillars of strength for each other. Nirmala is a shy kid and doesn’t often mingle with other children. She sits with her grandmother in the shop after school. Lakshmi hardly gets time to leave work and cook because she fears losing business, which is very limited anyway. Nirmala’s lunch is taken care of at her school under the government-sponsored Midday Meal Scheme. Nirmala goes to see her parents once in six months or so but is not so emotionally attached to her immediate family; she is happy being with her grandmother. Nirmala is the eldest among four, the other three sisters are in Kilakari, Ramnathanpuram district. Her father contributes a little money when he comes to see her, but Lakshmi takes care of most of the expenses. I wonder, if Nirmala were a boy, would she have been left behind by her family? In spite of poverty, fishermen often father as many children as they can so that they might have more hands to help fish, and their desire to have a son is relentless. But they also forget that more hands mean more mouths to feed. A girl child is also a greater responsibility, and it is an expensive affair to get her married, even in the poorest of the families. In case of Lakshmi however, her sons proved to be a curse. She seems frightened of them, as they come and beat her up for money. She has often thought of filing a police complaint against them, but checks herself. How can she file a case against her own sons? And even if the police would threaten or beat them, she would be the one who has to take care of them, because that is what being a mother means. Nirmala continues to be the only reason for her to live, else Lakshmi would have given up on life. Nirmala too goes to school in the hope of taking care of the enormous responsibility of three younger sisters as she grows up. Fisherwomen: is that even a word? What is the role of women in fishing, since it has always been about the men as with other occupations like postman or policeman? The truth is, women have always been integral part of fishing. They are actively involved in sorting and selling the fish in the market, apart from their daily chores of cooking and taking care of the household. However, one of things women don’t do is sail; there is danger, not from the sea but for their personal safety if they are caught by the navy of a neighbouring country. In the long human chain where Karadi and other fishermen from his group were working, I spotted Amudha, 26, and her sister Selvi, 28. These two brave girls were among the group of men who were working to pull the one-ton net, for which they are paid a daily wage of Rs. 50 – 100, while the men share the weekly profits. Amudha and Selvi were 2 and 5 years old when their mother, Muthukaraupayi, brought them to Rameswaram, as her husband married another woman, leaving his wife and daughters without a divorce. Their mother started to work as fisherwoman by pulling the rope, and through using the traditional way of fishing known as Olla Valla, where palm leaves are used along with the net, so as not to allow fish to escape. The daughters. without any protection of a father, struggled all their lives to survive and find their feet. Selvi has been accompanying her mother to work since from a very young age, while Amudha started to work just about two years ago. Recently, Muthukaraupayi met with an accident and cannot walk properly as a result. Both sisters work now to feed their families. Neither of them went to school. Selvi started to work with her mother when she was 12. She fell in love with a boy in the neighborhood and conceived when she was in her teens. Being clueless, she hid her pregnancy for four months. When her mother finally spoke to the boy’s family, his mother denied any sort of relationship between her son and Selvi. They approached the police and later went to court but their case couldn’t be proven. The case was settled outside court and they received a compensation of Rs.50,000 from the boy’s family. Some of the money they received was spent for the court case and lawyer fees. The balance is in a fixed deposit. During the trial, Selvi gave birth to a boy, who is now 14 and studying. Selvi didn’t send her son to work or to learn fishing, which is otherwise common among other boys in the community. She is protecting him from the harsh realities of a fisherman’s life. Selvi doesn’t want to marry, she wants to be independent and stand on her own two feet. Amudha married when she was 20, and has two children. Her husband is a fisherman who works in bigger boats in Mandapam as a daily labourer. He is an alcoholic who left her and the children and doesn’t provide any support. Here, girls are often married before they turn 18, so parents don’t register the marriage. Men often walk out to marry or be with other women. When these issues come up, it is the village leader who tries to resolve them. However, the women are ultimately left with the responsibility of the children usually without compensation or alimony. Because they cannot sail a boat, they will never be considered a proper fisherwoman—they are just the wives of fishermen who abandon them like old boats. The government school opened in Dhanushkodi about 10 years ago. Before, the children had to walk almost six kilometers to go to Pudduroad Government school, near Rameswaram. There was no transport connectivity; children had to wake up at 3 in the morning and walk on the unfinished, isolated road by the sea shore to reach school at 7am, and then do the 3 hour trek back to reach home by 7pm. Sharanya had to walk several hours every day to to go to school before she shifted to her relative’s place in Natarajpuram, closer to the school. She was rewarded her for her hard work when she became the first girl to get a Government job, and run the small thatched post office at Dhanushkodi earlier in 2017. It was a government officer from Delhi who had spotted her in the small shop run by her family that sells seashells to tourists. She belongs to a family of fisherfolk; her brothers and father fish together, while her mother sells the catch in Rameshwaram market. Her father, Ramalakshmi, is 42 and has his own boat. He earns an average of Rs.5000 per month while Sharanya makes about Rs.7000. When she got the job, the post office was housed in the school building a little further from the dwelling units at Dhanushkodi. Once, on a deserted Saturday, a few local drunk men touched her inappropriately, offering her a mobile phone in exchange for their atrocious actions. Sharanya was brave enough to report the incident and they were caught, after which the post office was shifted to a thatched ‘building’ closer to her home. However, the current post office hardly evokes confidence among customers, as many wonder if letters they post from there would even reach their destinations. Sharanya says that there is hardly anyone who buys inland letters or postcards here, as few are literate. Most residents now have cell phones and call their relatives when they can catch signals Despite her achievements, Sharanya unfortunately could not continue her studies after the 12th grade. There are hardly any girls in Dhanushkodi who continue to study after the 8th grade. Most girls drop out of school to either to be at home or help their family with fishing. By the time they are 15 or 16, they are often married, and within a year have a baby to take care of. Sharanya is the only one who wants to go to college, but her parents think it is too dangerous to allow her to go alone. On the one hand, they are extremely proud of her daughter’s achievements, but on the other she is a girl and needs to be married soon. When she was a child, At a very young age, Sharanya’s family told her was told that she would be married to the son of a relative. Sharanya wants to complete her undergraduate studies before that. After much persuasion, her father agreed to send her to an evening college so that she could continue with her day job. Sharnaya is an inspirational figure for other young girls of Dhanushkodi. They want to study beyond the 8th grade and want to work as well. However, her hopes have come to an end when her mother-in-law to-be did not see the use of her going to college and insisted that Sharanya get married to her son as soon as possible.